Eastern white cedar is a wood species very much appreciated for its natural resistance to rot and insect damage thanks to special oils with fungicide properties endowed by mother nature. This intrinsic protection renders any additional chemical protection completely superfluous. 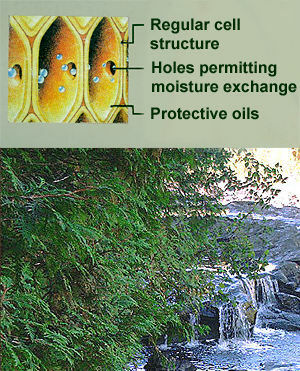 White cedar products offer you a service life which is much superior to any wood species even those chemically treated. At 335 kg/cubic meter Eastern white cedar is the lightest Canadian wood species. It is easy to nail without splitting. You may apply a wood stain to personalize its colour. Eastern white cedar has clearly proven itself for all exterioir applications and remains your best choice wherever wood is subject to wind and weather. Eastern white cedar typically grows in regions where limestone is prevalent. You will find it in humid soil as well as on dry grounds. Its natural regeneration ability is remarkable. Today's modern manufacturing processes make it possible to use all parts of the tree. The best grades are made into exterior siding, interior wall boards and mouldings. The more common grades as well as its by-products are transformed into landscaping products.